Chop 3 or 4 leeks and roughly the same amount in weight of potatoes. Purists use only the white part of the leek but I’m not fussy about using it all, unless perhaps I’m hosting a dinner party. Put a knob of butter in a pan on a low heat. Add the leeks and potatoes and sauté for a few minutes. 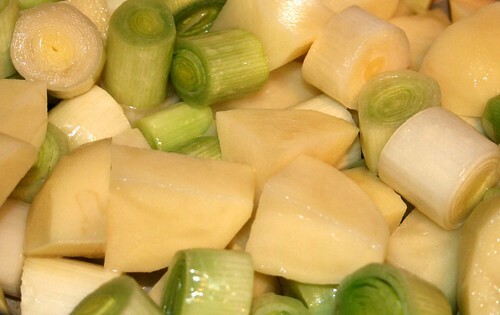 Add about a litre of vegetable stock, or just enough to cover the leeks and potatoes. Bring this to the boil and simmer until the potatoes are tender. Season and blend. If you want a richer soup add some cream just before you blend.